Reality: A section for those who like to costume and focus on historical accuracy. Fantasy: A section for those who like to dream. You can be inspired by furniture / pictures/ jewelry and should focus on originality. Artz: A section for those who run wild while dollmaking. Those paper, collage or recycled dolls would have their place this year. These sections will be maintained if at least one doll participates. If there are enough doll each section would be divided in Beginners, Intermediate and Advanced. Please include yourself in the advanced category if you are a professional, have won any Challenges or Ribbons or really "mastered this art". Also leave the beginners category to Real Beginners. We reserve the right to change a doll from one category to another that better fits it. We will have a Jury giving a virtual Blue Ribbon and also a People´s Choice award in each category. The doll must be completed before July 2004. You have to send me some pictures via email to msjbaal@infonegocio.com before the first of July. Please keep the picture less than 300 kb or contact me beforehand. If you don't have a scanner or digital cam email me and we will sort that out. 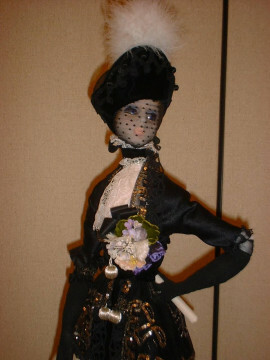 Remember that the picture are the only information that the judges will have of your doll, so please try to make them great. There is a tutorial by Sue Farmer on the Files section of the Group dealing with taking better pics. Any medium dolls can enter the challenge.